Natick, Massachusetts – InetServices, a leading provider of affordable high performance dedicated server and cloud server hosting announced its new Cloud Archive Storage (CAS). This new service is designed to provide long term archive storage that can be accessed not only by your servers but from anywhere. An extremely affordable solution for long-term data storage. InetServices CAS is designed as a very low cost, long-term, data archive storage. With this in mind all data transfers in are free of charge. But all data transfers out will be charged at $0.10 per gigabyte delivered. Sleep easier at night knowing that your most critical data is stored in easy accessible long term storage. 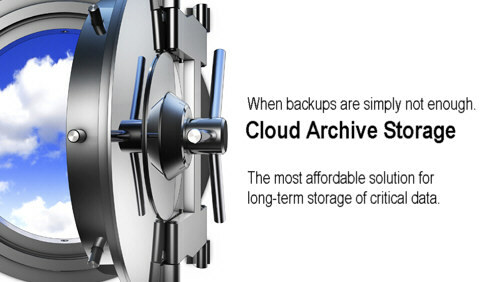 Starting at $20.00 per terabyte per month you archive up to 40TB of data at an extremely low cost. Use FTPS or sFTP protocol to access your cloud storage. All data is automatically encrypted at rest using Advanced Encryption Standard (AES) 256-bit symmetric keys. Choose from InetServices four data center locations to store your data in order to meet business or regulatory criteria. You can store up to 40TB of data per volume and you can have as many volumes as you need. InetServices is the leading provider of affordable high performance dedicated servers, managed dedicated servers, and cloud computing. The company focus is small and medium-sized businesses (SMBs) that require high-performance, high-reliability, and 24 / 7 live customer support, but don’t have the budget of a large enterprise. InetServices hosts thousands of SMBs from over 52 countries worldwide. Backed by four state-of-the-art SSAE16 Type II certified data centers (Boston / Chicago / Santa Clara / London) and an enterprise-class network, InetServices provides a competitive advantage necessary for businesses to compete. For more information, visit www.inetservices.com or call 888-983-9993.